Assam has been a land of Folklore and Folk culture. The history of Assamese Folk culture is vast and colorful. One of the most rich and colorful folk forms originating from Assam is the festival of Bihu. The word Bihu is derived from the language of the Dimasa people. Bi means “to ask” and Shu means “peace and prosperity” in the world. Hence the word BISHU gradually became Bihu to accommodate linguistic preferences. The other suggestion is that “Bi” means “to ask” and “Hu” means “to give” and so came BIHU. The Rongali Bihu or the Bohag Bihu is an important festival of Assam. The most important festivals of Assam are the Bihus, celebrated with fun in abundance by all Assamese people irrespective of caste, creed, and belief. Bihu celebrations begin in the middle of April and generally continue for a month. This is the traditional new year. In addition there are two other Bihus: Kongali Bihu in October (associated with the September equinox) and Bhogali Bihu in January (associated with the January solstice). Like most other Indian festivals, Bihu (all three) is associated with farming; as the traditional Assamese society is predominantly agricultural. In fact, similar festivals are also celebrated around the same time elsewhere in India. Bihu is also celebrated overseas by the Assamese community living in different countries around the globe. This album “Nangseng” is a collection of popular Bihu Songs sung by some of the most popular Assamese artists. 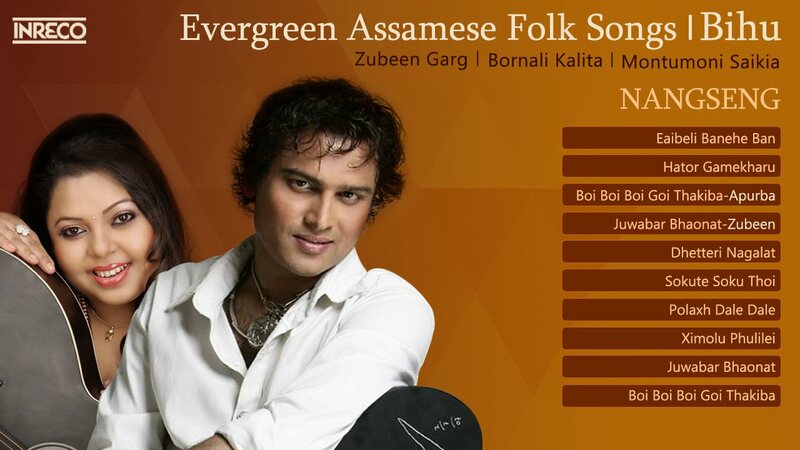 One of the singers featured in this compilation is Zubeen Garg a name that requires no introduction. Zubeen Garg is a popular singer from Assam whose melodious voice has won many hearts throughout the country. Other artists like Apurba Baruah have also done a fabulous job rendering the beautiful and ethnic vibe of Bihu Songs.Songs like Eaibeli Banehe Ban and Sokute Soku Thoi deserves a special mention. Over this entire album “Nangseng “is a quintessentially Assamese Folk Songs compilation and is a delight for every listener.